David Deakins (b. 1944) was born in England. David started painting in oils with a palette knife, at the age of eight. His first picture was a seascape measuring 3.5″ x 2.5″ which he still has. He spent many hours observing his father, George Deakins, painting in his studio at home, and in his cabin aboard ship when in Portsmouth. Following in his father’s footsteps, David was educated at the Royal Hospital School, Holbrook, which originated at Greenwich, but was moved in 1933 to Suffolk. It was a school for naval officer’s sons. The nautical influence left a lasting love of ships and the sea. 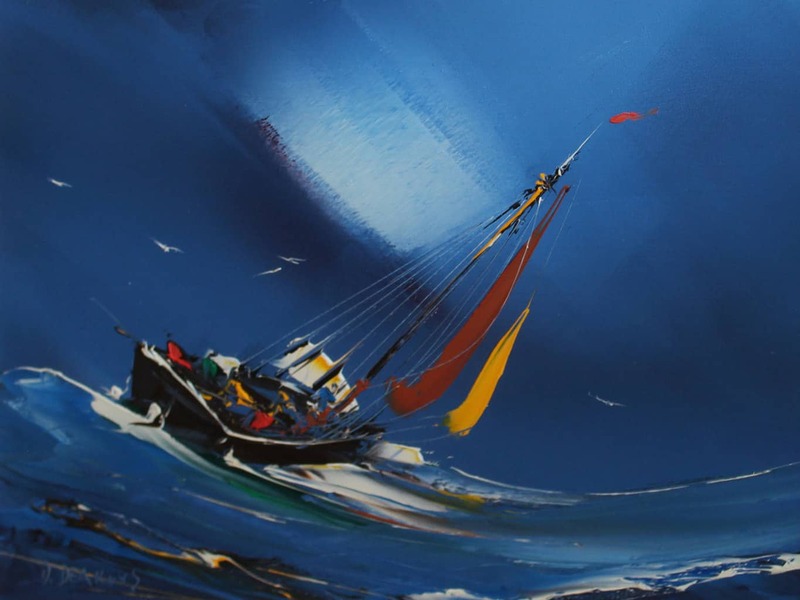 David Deakins enjoys painting both seascapes and landscapes in bold and atmospheric colours, but old sailing boats are his favourite subject, especially in rough seas. His paintings are sold widely throughout the UK and Ireland and have gone as far as Alaska and Mexico.